Sweet Briar College is hosting the seventh annual Blue Ridge Summer Institute for Young Artists (BLUR). For three weeks, gifted high school sophomores, juniors and seniors immerse themselves in two-dimensional art, sculpture and sound design on the College’s historic 3,250-acre campus. The coeducational artists’ retreat runs until July 9. Madison Cross Sugg, 18, of Cary, N.C., enjoyed the chance to experiment with pottery during his first week at BLUR. Eric Caldwell, director of the program, says that this year’s teaching team is particularly excellent. 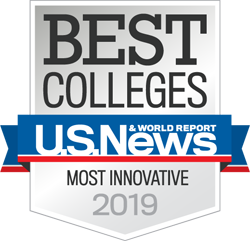 It includes Joshua Harris, assistant professor of music at Sweet Briar College, who is running the sound design/music composition area; Justin Rice, instructor of studio art at Sweet Briar, who heads the ceramics studio; and Annie Waldrop, who is chairing the studio art division. Students work intensively in each area in morning and afternoon sessions, and then gather as a group in the evenings for dynamic cross-training in others. 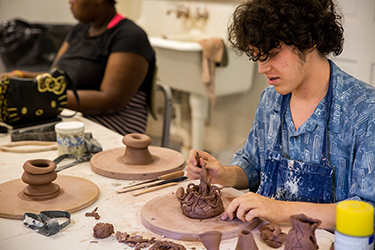 During these evening sessions, students learn how to slip cast ceramics, construct wire and fiber sculptures, author found sound compositions, play steel pans, pit-fire pottery and pursue other projects. “There are intensive art programs all over the country, but BLUR is unique in that it offers both intensive study in a single medium, and dynamic cross-training in many others,” Caldwell said. Caldwell knows what he’s talking about. An assistant professor of English at Sweet Briar, Caldwell maintained a mixed media sculpture studio in Charlottesville for eight years and keeps active by doing figural sculpture on the weekends. By challenging students to extend themselves beyond their areas of direct interest, Caldwell hopes to encourage the next generation of artists not to settle into a single artistic area, but to adventure into many.